Marking a return to painting and drawing where his journey as an artist began, this exhibition is entirely comprised of 2-dimensional work. These constructions are an unusual combination of drawing, screen printing, and painting. Figures are composed of screen printed everyday imagery such as tools, flowers, birds and architectural references, creating unexpected narratives. Contemporary themes such as political anxiety and environmental catastrophe, mixed with joy and hope are treated with humor and irony. While some of the work can be considered self-portraits, many of the figures are not depictions of specific people but are built from a variety of sources. Perkin creates figurative ceramic and mixed media sculpture, inspired by human and animal forms. The surfaces are rich and organic, with agitated, colored and etched surfaces. 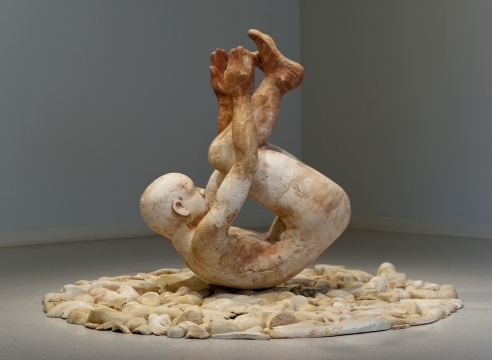 Perkin’s work reflects upon the primal urge to create, destroy and then resurrect the human form. His sculptures are thoughtful and inquisitive—sometimes aggressive, sometimes restful, but always passionately felt.